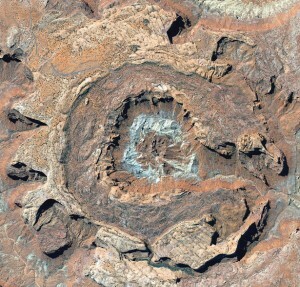 Aerial view of Upheaval Dome. A salt dome is produced when a subsurface layer of salt (originally deposited when a large body of saline water evaporated) is eventually squeezed upward because of the weight of overlying rock. At Upheaval Dome, the upward flow would have to have been “pinched off” by rock that fell into voids left by salt dissolved by surface water. The pinched-off salt dome hypothesis assumes that up to 20 million years of moderate pressures produced the feature, compared to only a few minutes of extremely high to low pressure changes for the impact crater hypothesis. Until recently, “smoking gun” evidence for either origin was absent because of erosion. No remnant pieces of salt or related rocks and minerals have been found to support the pinched-off salt dome hypothesis; neither were formerly molten rocks, ejected and crushed rock, or minerals altered by high pressure found to support the impact crater hypothesis. Then, in 2007, German scientists Elmar Buchner and Thomas Kenkmann reported finding quartz crystals that were “shocked” by the high pressure of a meteorite impact. 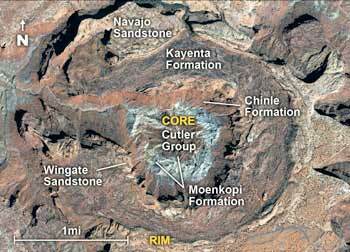 Many geologist now consider the mystery of Upheaval Dome’s origin to be solved (and it’s an “innie”!). The core consists of the oldest rock formations at Upheaval Dome. The Organ Rock Shale and White Rim Sandstone of the Permian Cutler Group, and Triassic Moenkopi Formation were injected and pushed upward in a chaotic jumble. The Triassic Chinle Formation, Triassic-Jurassic Wingate Sandstone, and Jurassic Kayenta Formation and Navajo Sandstone are stacked, oldest to youngest, from the core to the rim. 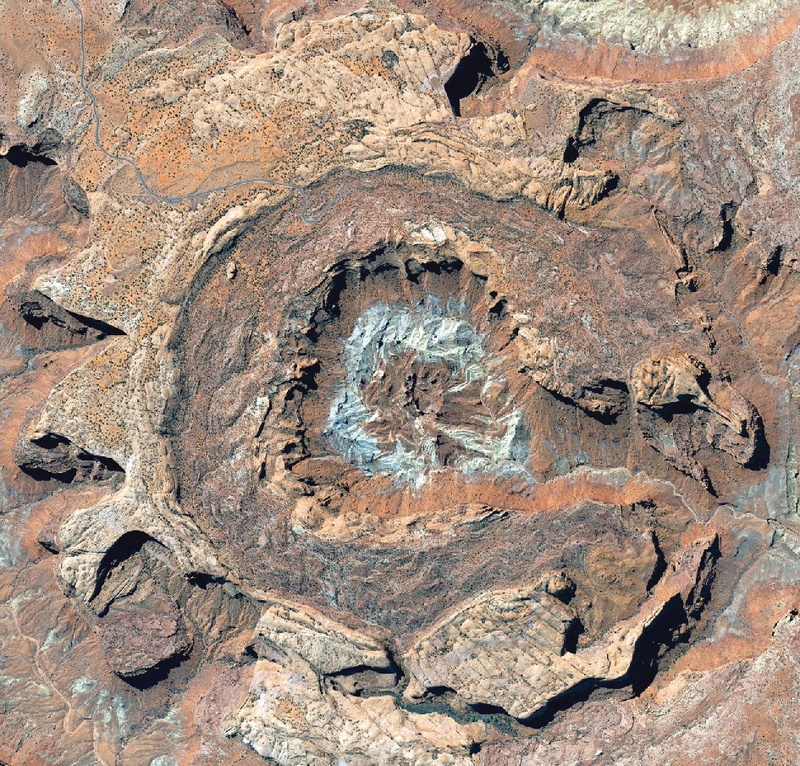 Upheaval Dome is in Canyonlands National Park. From I-70 at Crescent Junction follow U.S. 163/191 south for 20 miles to Utah S.R. 313. Head west along S.R. 313 to the Canyonlands National Park entrance station and visitor center, continue to Island in the Sky, and then bear right to Upheaval Dome, a distance of about 30 miles. Enjoy the picnic ground at Upheaval Dome and take the short but steep overlook trails, or, if you are an experienced, well-prepared hiker with about eight free hours, take the Syncline Valley trail. There is signage with trail directions and mileage.